Once, under of the visionary leadership and total commitment of President John F. Kennedy, the U.S. mobilized successfully for an unprecedented achievement, creating from scratch the previously non-existent technologies and capabilities that brought humans to the Moon. The spirit of conquering the unknown, that which lies in the future, and bringing it into reality, is a quality which is uniquely and universally human. 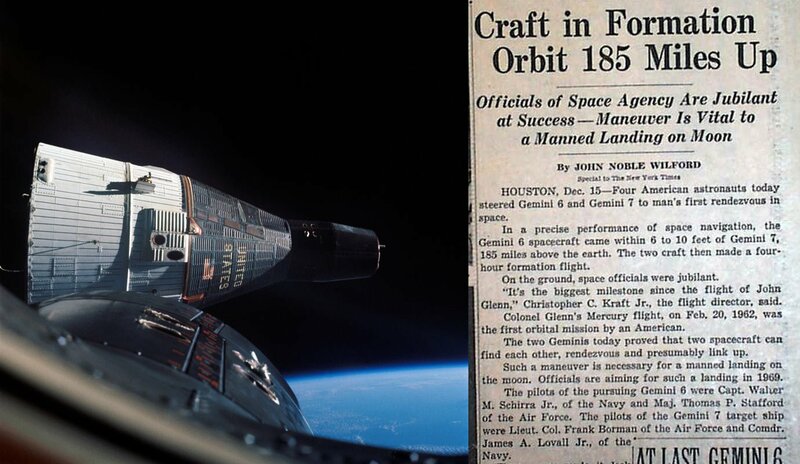 It was this spirit which animated the breakthroughs of the space program of the 1960s. Even before the 1969 Moon landing, it was unknown whether many of the actions necessary to accomplish the eventual lunar goal could be carried out. For example, it was not known whether it were even possible to rendezvous two orbiting objects, a maneuver which proved to be completely counter-intuitive,1Orbital mechanics work very differently than movement on Earth. If you want to catch up to an object ahead of you in orbit, and you speed up, you will move to a different orbit, and further away from the object ahead! until the technique was figured out, and demonstrated for the first time by the 1965 Gemini 6 & 7 missions. This spirit of achievement was vectoring mankind very quickly beyond the Moon, to reach destinations in deep space, as evidenced by the rather successful program to develop nuclear rocket propulsion technology, necessary for distant travel, the NERVA rocket program.2NERVA, which, with its 1950s predecessor Project Rover, was shut down in the early 1970s despite its great successes. Today, after 50 years of takedown of the space program, and especially the recent reprehensible attacks on and sabotage by Barack Obama, the U.S. cannot even put people into orbit, let alone replicate what was accomplished nearly 50 years ago. What most Americans don’t realize is how quickly this could be reversed. As recently as 2010, it was official U.S. policy to return people to the Moon by 2020, and a mobilization was underway within NASA to do it. The Constellation Program, part of the 2004 “Vision for Space Exploration,” committed the U.S. to building a new fleet of rockets, crew vehicles and lunar landers (hardware and associated infrastructure lost since the post-Apollo takedown of our space capability) to land men on the Moon, and to do this as the necessary technological stepping stone to landing man on Mars. The program included the Altair lunar lander, the Orion crew capsule, and the Ares I and V rockets. It was complemented by other (some already ongoing) programs which were folded into a unified mission-orientation, such as the development of a nuclear-powered rocket engine (Project Prometheus), necessary for efficient travel beyond the Moon, to be tested by visiting the icy moons of Jupiter, and other exploration programs, such as the (now successful) New Horizons mission to Pluto. 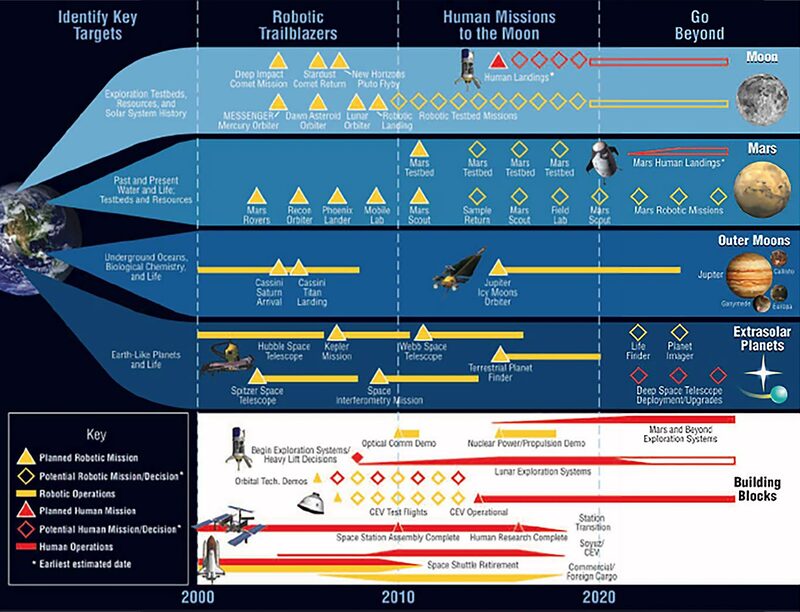 The timeline published by NASA in the 2004 "Vision for Space Exploration" folds existing mission (such as the Hubble Telescope, and the New Horizons mission) into an overall effort toward the Moon, Mars, and beyond. The Orion crew capsule and service module were designed for 4-6 astronauts (as opposed to the Apollo Command Module's 3). The Altair lunar lander, designed for 4 astronauts, with 5 times the volume of the Apollo program lunar module. The Ares rocket family (right) compared with earlier Saturn V (Apollo era) and Space Shuttle Solid Rocket Booster designs. The fleet of Ares rockets was designed to get all of the components needed for the long journeys to the Moon and Mars into low Earth orbit, where they would rendezvous with the crew and depart for their destinations. A depiction of the proposed Jupiter Icy Moons Orbiter, with its nuclear-powered ion engine, just entering Jupiter's neighborhood. Other complementary missions to orbit and study the Moon in preparation for human activity there include the Lunar Reconnaissance Orbiter, which is still currently operating, and has sent back beautiful ultra-high resolution images of the Moon’s surface, data on the lunar radiation environment, and evidence of the existence of water ice on the Moon. Recently-concluded missions have mapped the Moon’s gravitational field (GRAIL), flown through and analyzed the lunar atmosphere (LADEE), and made a crash landing into a crater (LCROSS) which showed that there is, indeed, water on the Moon. The Apollo 17 landing site, complete with tracks of the Lunar Roving Vehicle, foot tracks of the astronauts, the “Challenger” descent stage, and other equipment. The GRAIL mission (1-year mission from December 2011-2012) consisted of two orbiters flying in tight formation, which made a mapping of the Moon's gravitational field, among other studies. This NASA video depicts the LCROSS vehicle impact in the Cabeus crater, and the LRO detection of the composition of the debris plume thrown skyward, which included water ice. Despite the half-decade of work and progress, and billions of dollars of investment (even with chronic underfunding), the Constellation Program was abruptly canceled in 2010 in an act of unabashed viciousness by the Obama administration, which issued the flippant statement that the program was “over-budget, behind schedule, and lacking in innovation.”3Office of Management and Budget statement on NASA funding for FY2011. By also following through with the scheduled (but not necessary) ending of the Shuttle program in 2011, Obama left the United States completely bereft of the capability to put people into space—back to the pre-1961 days.4Today, astronauts are given rides to space and back on Russian rockets and in the Russian Soyuz space capsule. This reliance was pointed out by Russian Deputy Prime Minister Dmitri Rogozin, who quipped, "After analyzing the sanctions against our space industry, I suggest to the USA to bring their astronauts to the International Space Station using a trampoline." If not for the salvaging of the Orion crew capsule (in a modified form), and the creation of a new (cheaper) rocket program, the Space Launch System (SLS) by the Congress, against the intentions of the White House, the U.S. would not even have the veneer of an intention to return people to space. However, even these modified projects are under attack and are being de-funded by the Obama administration, as evidenced by the White House FY2017 budget request. We Must Join China on the Moon! Our space program can be revived! The capability and the passion are there on the part of the army of scientists, engineers, astronauts, machinists and the many others who sent men to the Moon 40 years ago, and those who have begun to extend our (robotic) reach far beyond in the years since. This excitement naturally extends to America’s young people, over 18,000 of whom applied to be astronauts in 2016—more than twice the previous record in 1978. Under the leadership of a new presidency, one committed to the vision for man expressed by John F. Kennedy, these capabilities can be supported and mobilized to meet the challenges of fulfilling the existing potential of mankind's activities in cislunar space, and in moving far beyond to a new understanding and control over our Solar system and galaxy. And most importantly, this cannot be achieved by any one nation. China has offered cooperation in space to the U.S. and all other countries, and the great promise of such cooperation is seen in the historic, joint 340 day stay in space recently completed by American astronaut Scott Kelly, and Russian cosmonaut Mikhail Kornienko. A coordinated vision and policy of developing man in the solar system, to which each nation can make a unique contribution, is the road to a future for mankind. The U.S. has powerful and unique contributions to make, and we must immediately change course, and join the efforts toward the next steps (human and otherwise) on the Moon. The U.S. has not had a rocket capable of bringing people to the Moon since the last Saturn V was launched in 1973. Which country or countries now have that capability? That's right. No one! China’s Long March 9 is scheduled to be ready in 2030. The NASA SLS heavy-lift rocket equivalent of the Saturn V is not scheduled for use until the 2030s, and further budget cuts by the administration make these deadlines doubtful, until full-support for manned spaceflight can be restored under a new presidency. By Lyndon H.LaRouche, Jr.This 1986 paper was a key part of Mr. LaRouche's campaign for President, and was the basis of his famous television broadcast, "The Woman on Mars". While the specifics steps for a space program today may differ from this writing, the overall principles remain the same.